NOTE: For those of you who are visual, there are a number of photos at the bottom of this post. Enjoy! 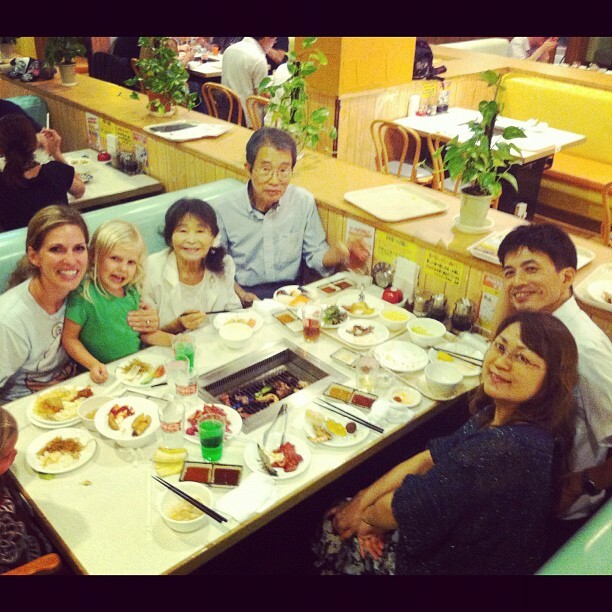 Greetings from the Cooper family in Sapporo, Japan! We have reached the 3-month mark of our 1-year mission at Grace Church Sapporo and cannot believe how much we have seen the Lord accomplish here for His glory! We LOVE life and ministry here in Sapporo, Japan. It is incredible to be serving the Lord here in this community of believers among the unreached of Japan. We continually thank the Lord for your faithful partnership through prayer and financial support. After 3 months, we have seen over 350 Japanese personally hear the gospel from a Japanese believer with 8 affirmed new believers (to give context, 400 heard the gospel w 10 new believers the previous 12 months). PRAISE GOD for fruit!!! Many of you are following us on Facebook & Twitter so have witnessed much of the “play-by-play” ministry fruit as it is revealed through photos and updates. I will attempt to summarize some of the many things we see God doing here among the unreached in this post. Please feel free to post or email questions and/or comments. We would love to hear from you! 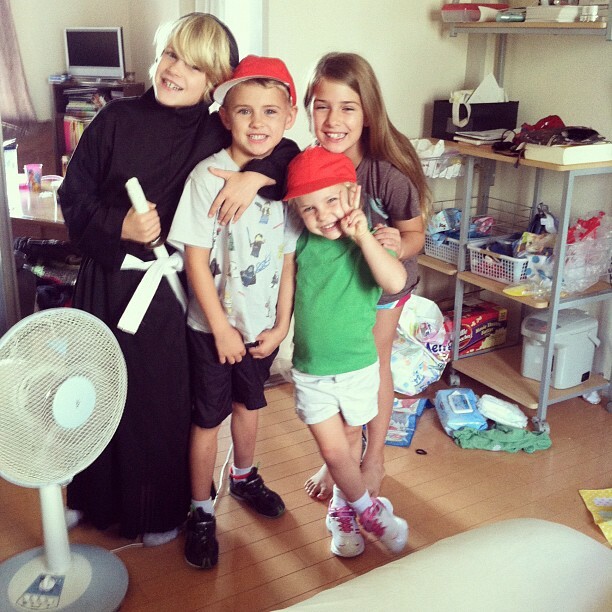 –School: Mayah, Malachi, Isaiah & Tessa continue to love Japanese school. 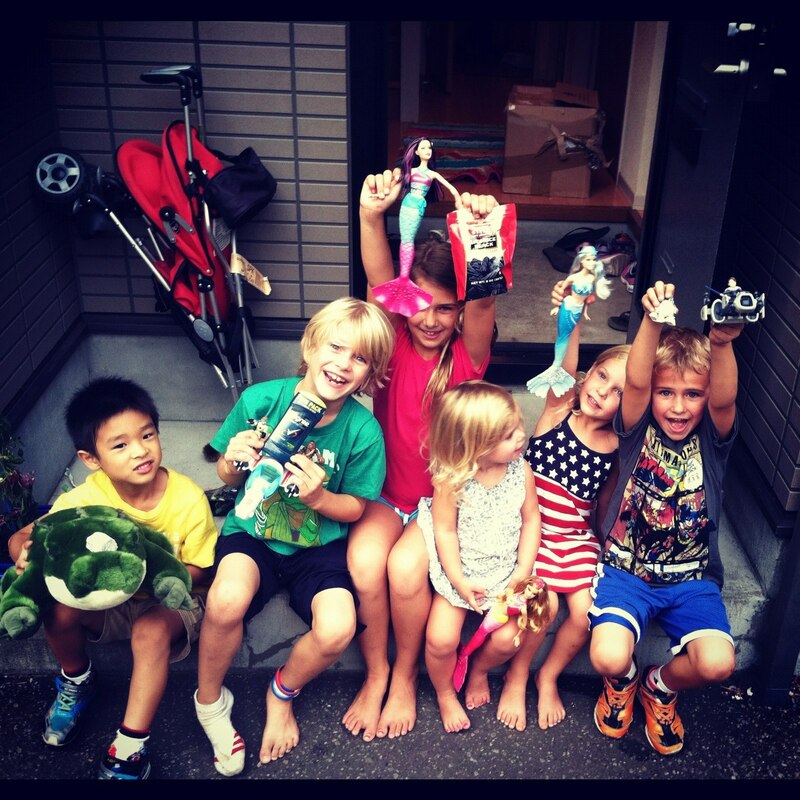 They are each are making friends and continuing to grow in their Japanese language skills. The principal said they should be able to understand and communicate effectively by Christmas time. 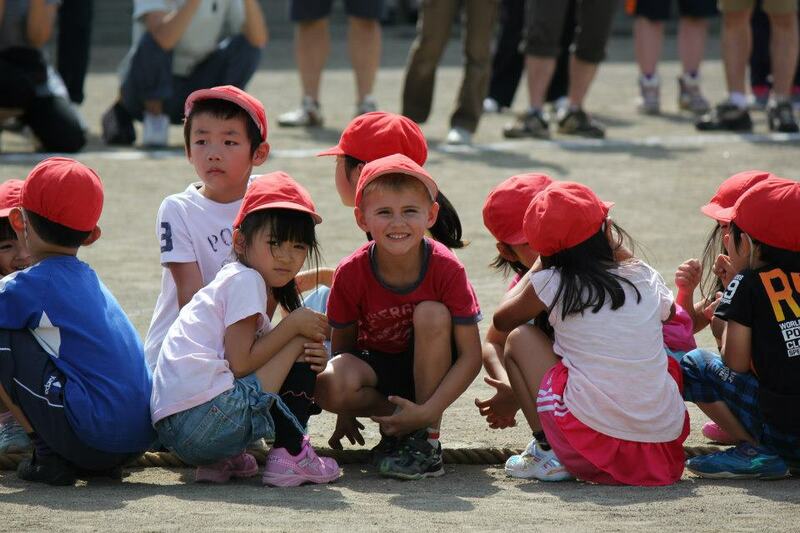 –Undokai (Sports day): Japanese schools enjoy an annual event called “undokai”. It is like “field day” in America but with a lot more pizazz. The entire family attends this excting event (including grandparents). We loved attending the undokai for Isaiah & Tessa’s Kindergarten. It was so much fun for us as a family to enjoy the events while also building relationships with Japanese families from the school. –Date Nights: Rachel & I continue to enjoy weekly dates on Tuesday nights. With hundreds of unique/locally-owned eateries & cafes, Sapporo is an incredible place to date. We can walk, ride our bikes or take the subway pretty much anywhere. We use the time to connect in conversation, laugh a lot, play Monopoly deal, evaluate our marriage/parenting and thank the Lord for what He is doing in and through us. We are so grateful to Moe (Mo-ay) Watanabe for serving weekly as our babysitter. –Care Packages & Letters: I had no idea how much it means to missionaries when they receive a letter or care package in the mail (emails, Facebook posts, Skype calls, etc are also encouraging). It was so much fun to watch our kids open up the big box that their Aunt Amy (Long) put together along with their grandmas (Mary Lou Cooper & Karen Long) and close friend/Rachel’s discipler, Beth Timberlake. In addition, Troy received a kind and encouraging care package from Pastor Eric Bancroft that included a commemorative gift watch from Castleview Baptist Church. We praise God for how He uses His global church (Christians) to sustain and encourage one another (including us). –Disciple-making Training: Pastor Kamidate has really caught the vision for disciple-making that leads to multiplication of new disciples and churches. 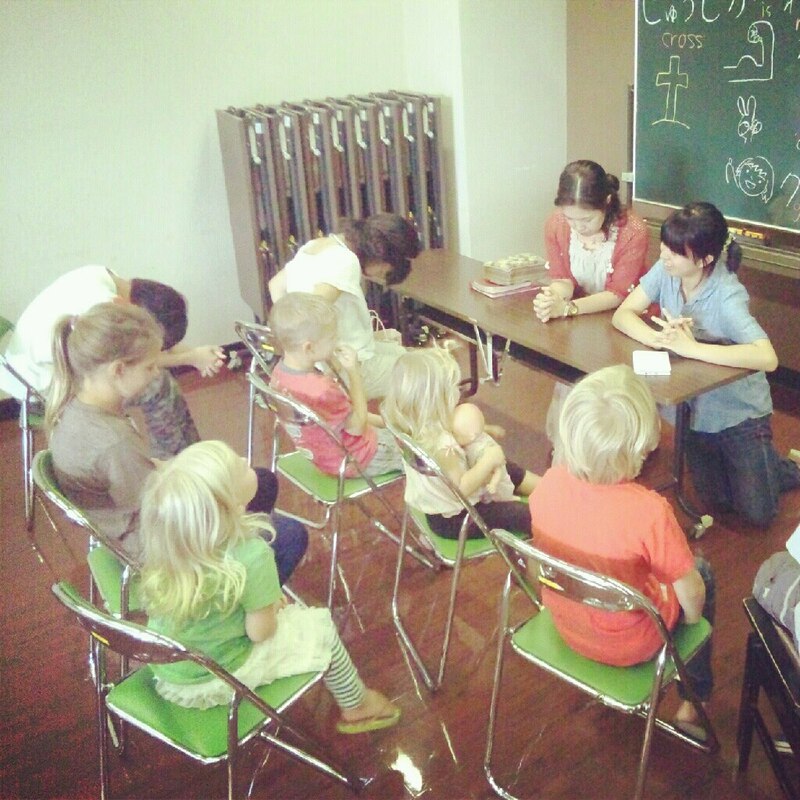 He has taken the T4T training and prayerfully modified it for the Japanese context (a HUGE answer to prayer). He is taking steps towards implementing into their evangelism strategy, discipleship groups and church multiplication plan. Troy continues to provide training, coaching and personal discipleship for leaders and church members. 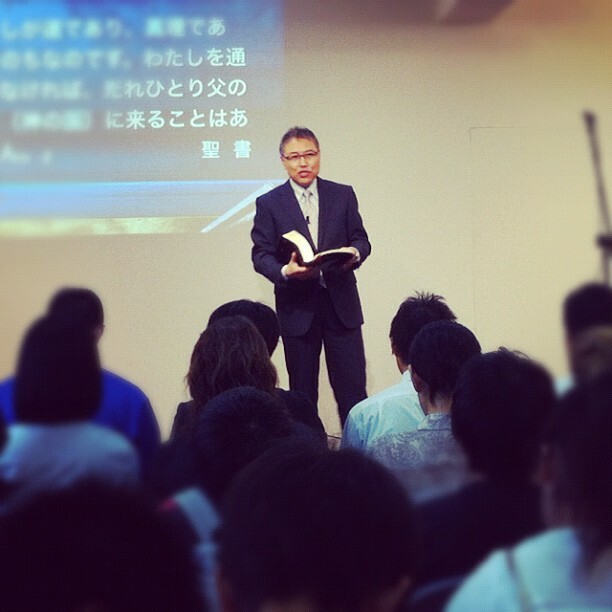 We are seeing more Japanese believers grow in their discipline of personal evangelism. This is very important as they are trained to lead others. If they are not evangelizing, there is the danger their discipleship will lack evangelism. The believers at GCS have vision and passion to reach the 1.9 million of their city and 5.5 million on their island of Hokkaido. They live out this vision daily!! –Preaching: Troy has been blessed to preach every 2-3 weeks on Sunday mornings at Grace Church. He has been preaching a series on forgiveness which God has used to dramatically impact us as well as the other church members. A very helpful resource in preparing for this series was a couple of sermons by James MacDonald (passed along by Eric Timberlake). You can view video of these sermons by clicking here: Unforgiveness-part 1 | Unforgiveness-part 2. –Personal Evangelism: Rachel has opportunities to share the gospel with people on a daily basis. She is so bold in her faith and proclamation of the gospel! 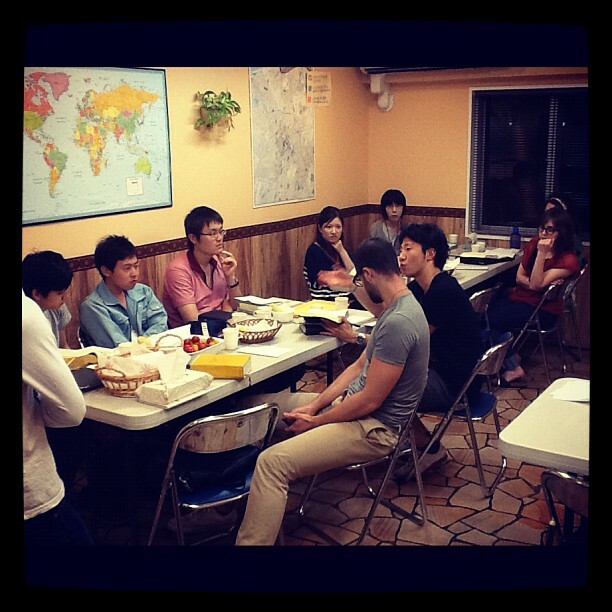 Troy prays each week for an opportunity to share with an English speaker and God has faithfully answered. –Thursday Hospitality: We have begun to use Thursday nights for hospitality. After the kids are in bed, Alicia Bechtle joins us (she is family) most weeks along with other individuals and couples from the church for a time of fellowship. –Iwamizawa: We continue to travel one Sunday a month for preaching, disciple-making training and fellowship with Pastor Nakajima and the believers of Vine Church Iwamizawa. 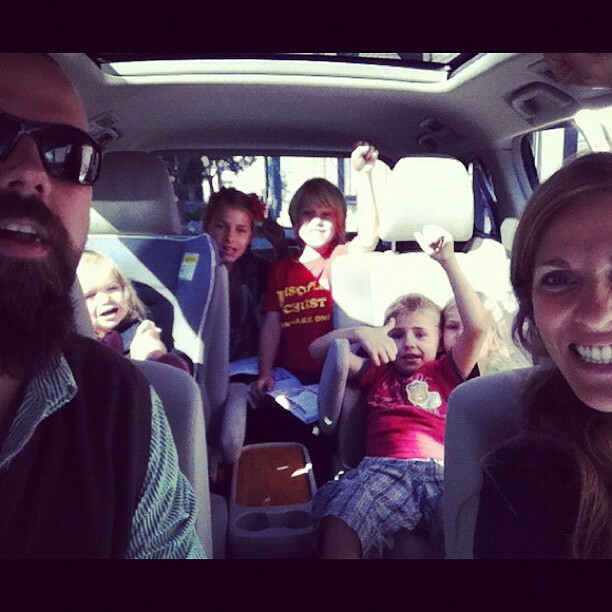 They are growing in their conviction and zeal to make multiplying disciples. This is evidenced by their increased practice of personal evangelism and renewed vision to reach their city of 80,000 with the gospel. 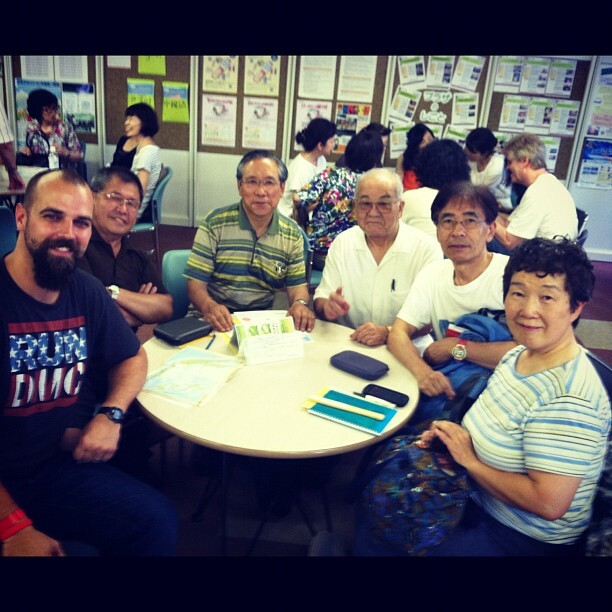 –diSkypleship: While in Japan, Troy continues to coach and disciple others including college students, pastors and missionaries. 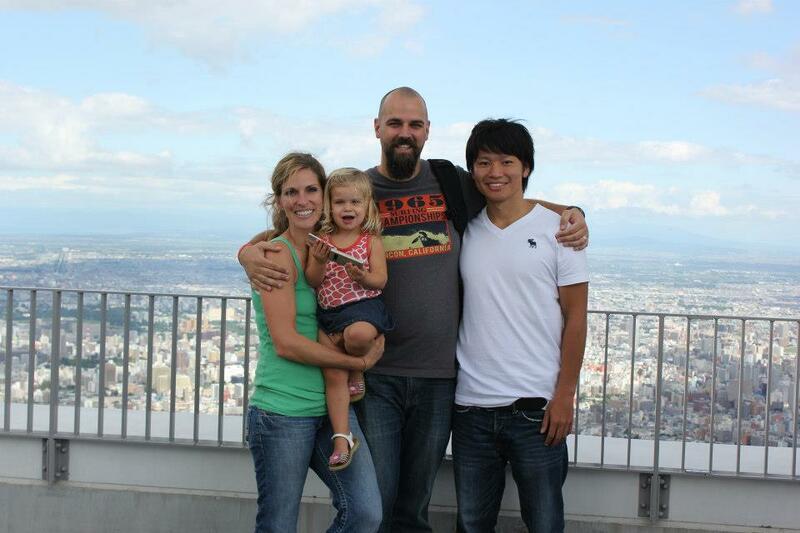 One of the missionaries is serving in Tokyo along with his wife and small child. They are laboring to start a disciple-making movement in a local church and on college campuses. Troy is continually encouraged as God works through these disciple-makers to produce fruit. –Well Invested in: As we invest in others through evangelism and discipleship, be encouraged that we are continuing to be invested in on a regular basis. We both meet weekly with Pastor Kamidate for equipping, coaching and fellowship. In addition, Troy is discipled and coached regularly by pastor Gary Stump, missionary Steve Parlato and other missionaries. We both speak consistently with our parents and other family members (technology is amazing) as well as other friends and disciplers back in Indy. We wanted you to know that we are are being personally developed and cared for…the fruit of your prayers. –Troy’s Language study: Troy is 3 weeks into his language training. He is attending a private 2-hour class every Monday and Thursday afternoon. He is working hard and enjoys practicing with church members and others in the community. He will not be fully fluent but is taking steps towards communicating and understanding. This goes a long way with the Japanese that he is making an attempt to learn their language. Thank you to Pastor Gary Stump and Onward Church for generously providing the financial need for language training. –Monthly Support need: We are thankful for how the Lord has been faithful to provide our prayer and financial needs. However, there are a number of monthly commitments that have not been followed through on. I only share this as a reminder to those who made a commitment that we have based our budget off of projected giving commitments. Thank you for your continued support and prayers! –Jon Mobley coming in November: We are thrilled that our dear friend/ professional videographer/ gospel magician, Jon Mobley (aka Johnny Magic) is coming to Sapporo November 17-26 for a short term mission trip. He will be serving the church through production of gospel video resources as well as performing for a gospel magic outreach event. 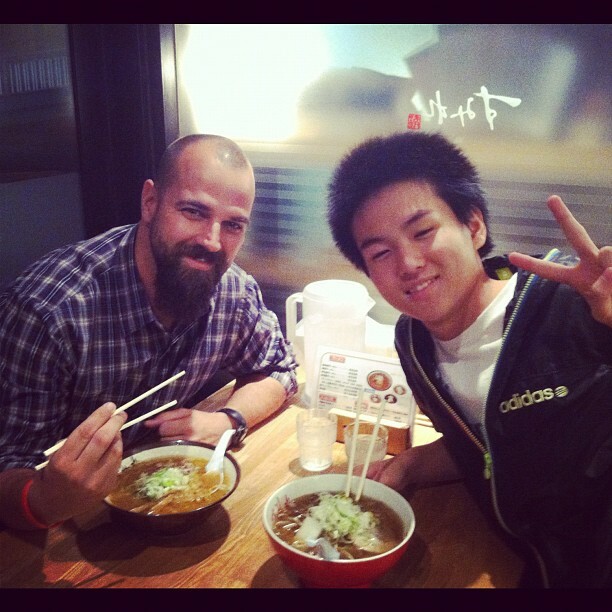 Please pray for Jon as he prepares for this trip and that God will yield fruit from his time here in Sapporo. –Grandma Cooper: Troy’s 96-year-old grandma Cooper (aka Gramma-tron) fell and broke her hip last month. After surgery and a few scares, she is stable and recovering. Please pray for her continued recovery. –Japanese Pastors: Wisdom and protection for Pastor Kamidate & Pastor Nakajima as they implement Japanese disciple-making strategy in their respective communities in Sapporo & Iwamizawa. Pray for unity among the believers (change provides opportunities division). –Growth of 8 new disciples: Iwasa, Jaclyn, Fu, Li, Matsuyama, Pon, Akina & one other teenage boy – that they will grow in their faith and be used by God to reach their family and friends with the gospel. –Seeds planted: There are hundreds of people who have heard the gospel and a number of them are in discovery Bible studies. Pray for God to yield fruit among these seeds planted. –Sowers: pray for the Japanese believers in Sapporo, Iwamizawa & Tokyo to faithfully share the gospel and to disciple new believers to grow in their faith (including make disciples). –Vision for Sapporo, Hokkaido: Pray for the God to accomplish Pastor Kamidate’s vision to reach the 1.9 million of Sapporo city + the 5.5 million of Hokkaido (island) with the gospel of Jesus Christ. Keep in mind that 99.6% of these do not know Jesus and most have never heard the gospel. –Multiplication: that seeds of the gospel will yield an exponential harvest of multiplying disciples + multlying churches across the island of Hokkaido. –Provision: the Lord would continue to provide consistent prayer support and the financial support required for our ministry here in Japan. 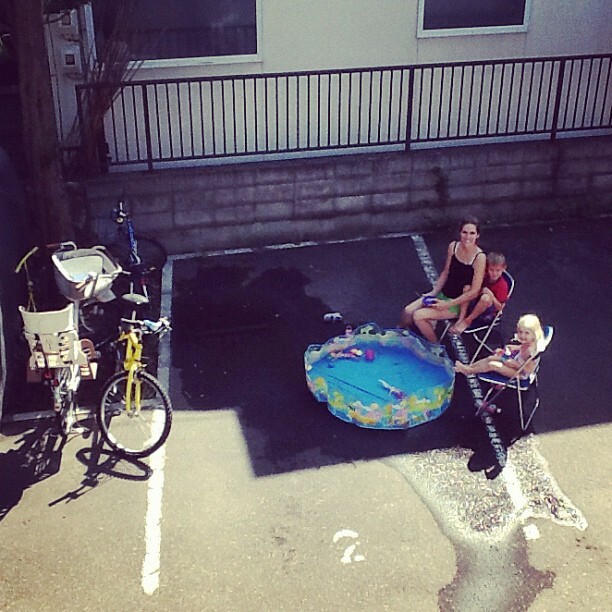 Rachel & kids enjoy the shade in our pool-side parking spot (notice our fleet of bikes). Rachel is an awesome mom who finds fun in the sweltering heat. 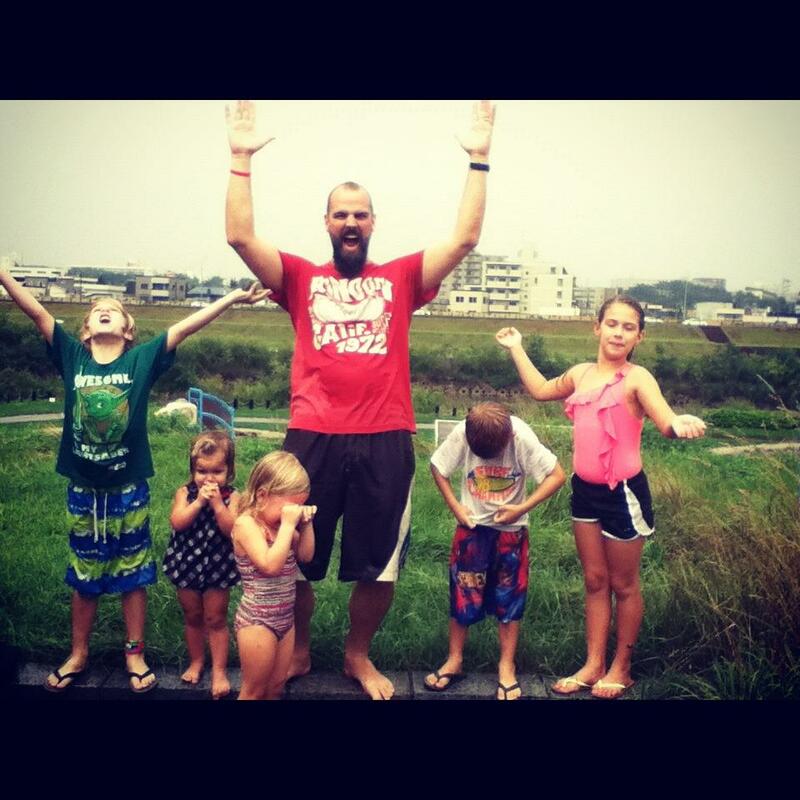 A family afternoon playing in the river got interrupted with rain…so we played in the rain. We had so much fun together! 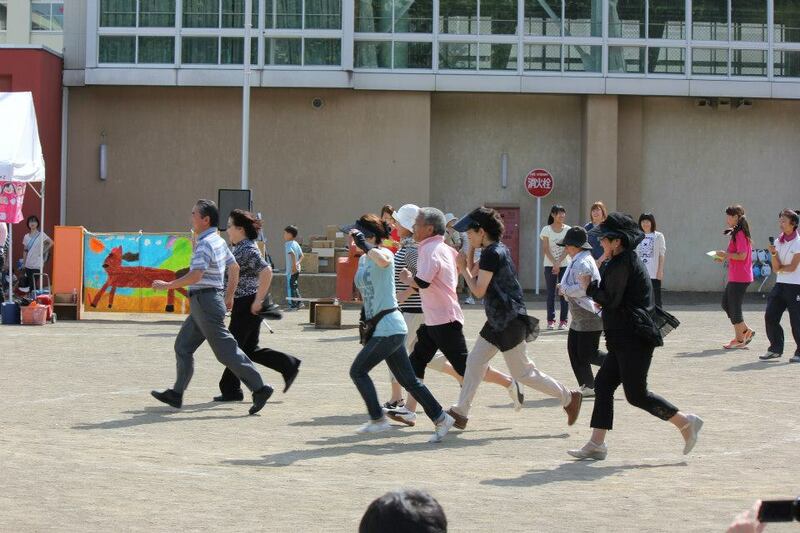 Preparing for street evangelism (“robou dendou”) at Odori park in downtown Sapporo. Sowing seeds of the gospel in Sapporo. Armed with God’s Word, God’s Spirit and His Church (other believers), these guys set out to share the gospel with Japanese people in downtown Sapporo on a Saturday. I am so encouraged by their discipline of evangelism. 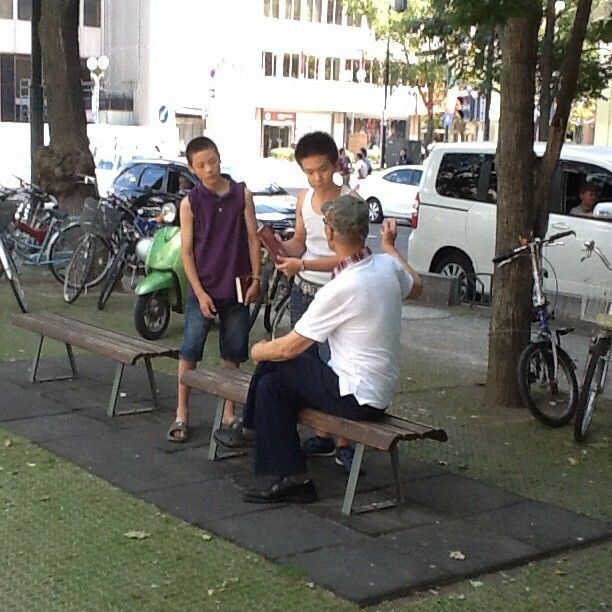 Hori & Reo boldly share the gospel of Jesus Christ with a man at Odori park in downtown Sapporo. 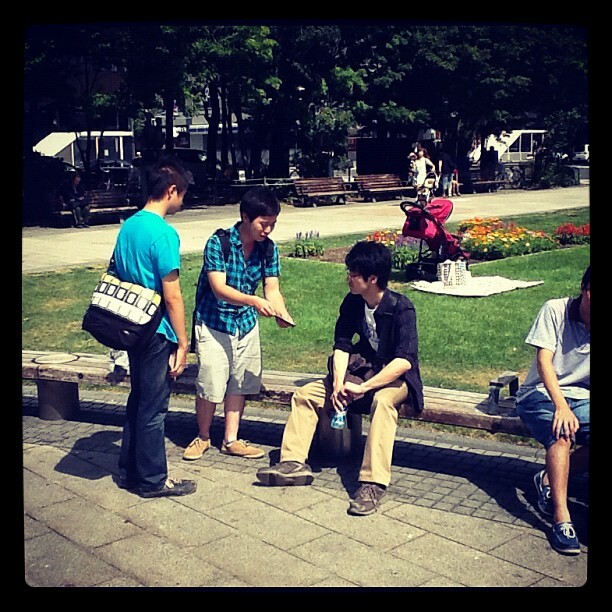 KonKen (R) and Masayoshi share the gospel with a man at Odori park in downtown Sapporo. SO excited that these teenagers are bold to share the gospel! 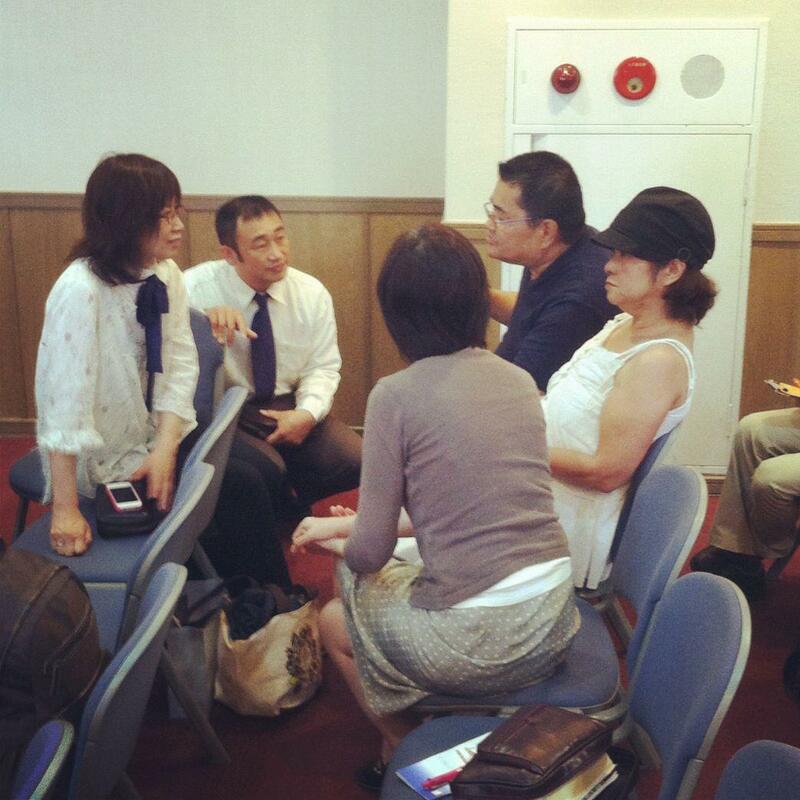 Japanese believers share the gospel and invite people to Jesus. They also invite them to the weekly Sunday “Gospel Rehai” outreach service which takes place after the believers’ worship service. They hear music and then Pastor Kamidate preaches the gospel (pictured). The believers then do follow up after the message. 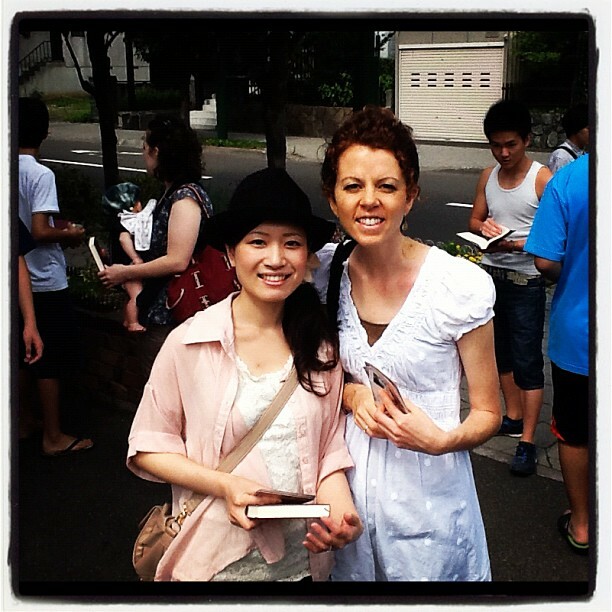 Chikako (left) and Mayuko met this couple (right) on Saturday during street evangelism. They invited them to Jesus (shared the gospel) and then invited them to the outreach service where they heard the gospel preached clearly. They are then followed up with (pictured) after the message to have the gospel explained and see if they believe in Jesus or would like to participate in a discovery Bible study. Training AFC (Alive for Christ) College/Singles ministry in T4T 3/3s Bible Study which accomplishes evangelism, discipleship, leader development and church multiplication using God’s Word. Leader discipleship/coaching: Troy has the joy of meeting regularly with a number of leaders for discipleship and ministry coaching. KonKen (pictured) is the 16-year-old leader of Life Club (JrHi/HS Ministry). His parents do not know Jesus and he faces much persectution…which strengthens his faith and allows him to disciple other teens who face the same struggles. 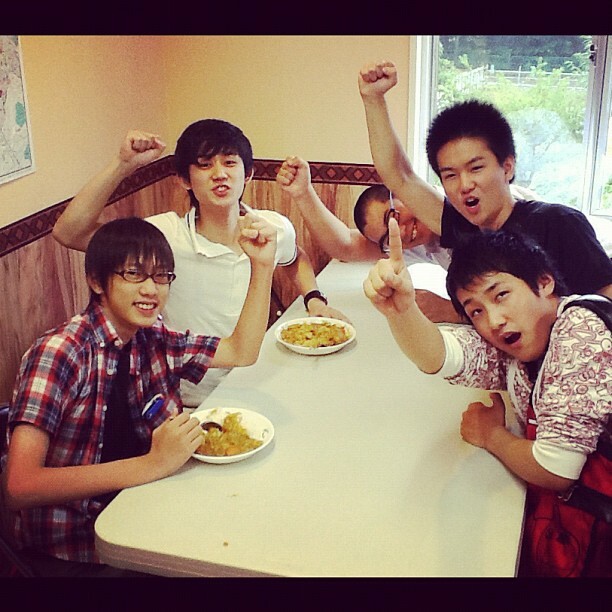 Pray for KonKen and the disciple-making bunch of teens at Grace Church Sapporo. PRIME is our weekly English Bible study outreach. We enjoy a monthly activity like this pizza party we had in late August. 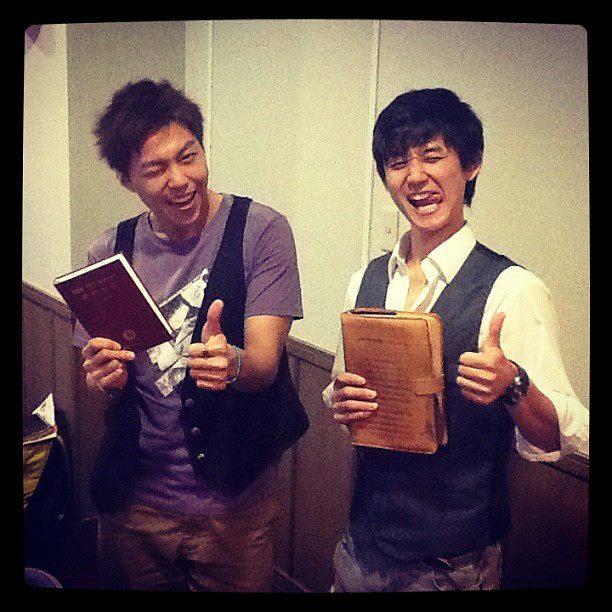 Believers invite unsaved friends (two pictured here) to come study the BIble, listen to music and interact with Christians. Pray for fruit! New Believer! : Iwawa san (left) is a coworker of Kachi (right). Kachi prayed for Iwasa san and share the gospel with him. He then invited him to PRIME where he studied the Bible and then expressed interest in studying the Bible with Kachi. We praise God with all the angels of heaven that Iwasa san has trusted Christ as his Lord & Savior and is now being disicpled by Kachi to grow in Christ and share the gospel with his family. Pray for Iwasa san to grow and for God to save his entire household! JrHi & HS Students are equipped to make disciples through discover BIble studies. New Believers! : Matsuyama san (left) is a JrHi school classmate of Norihito (center) and Pon (right, new believer) and after hearing the gospel has trusted Jesus as his Lord & Savior (had just believed when this photo was taken). 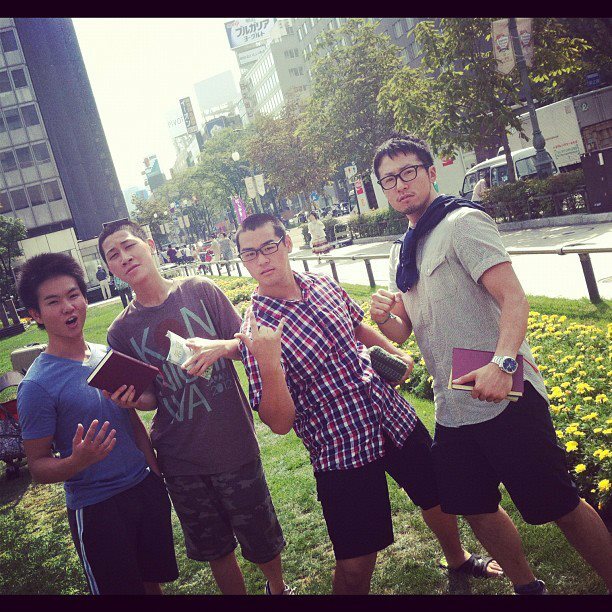 He is being discipled by KonKen (2nd from right) and is being equipped to make disciples. Pray God saves their households! Thursday Night Hospitality: We enjoy having Alicia Bechtle and other individuals/couples from Grace Church over on Thursday nights after our kids go to bed. Food, fellowship and loads of fun together! Alicia & Mayuko pair up to go share the gospel in Sapporo. 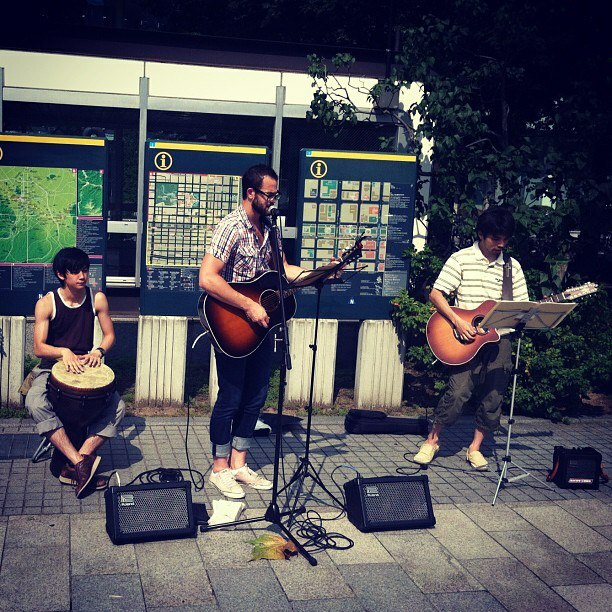 Chris Juday leads a group of musicians who perform/sing worship songs in downtown Sapporo while others share the gospel. They have MAD skills!!! 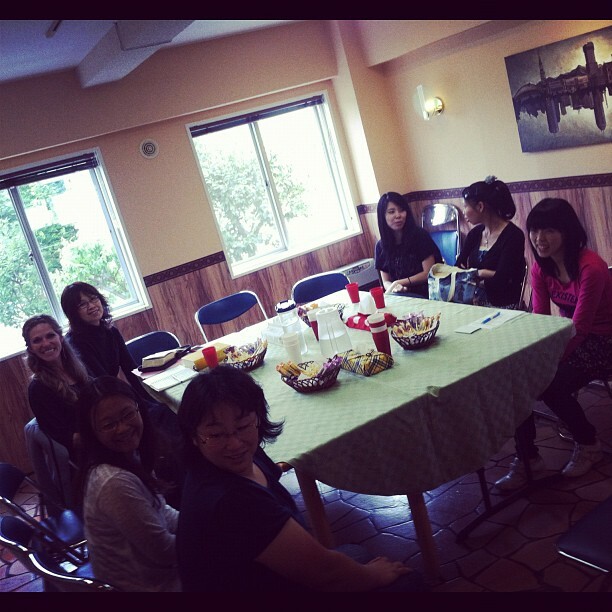 Church family: We love our Grace Church Sapporo church family. Laura (Jarrett) Noguchi and Yoshiki are awesome (yes, he is a budding Colts fan). 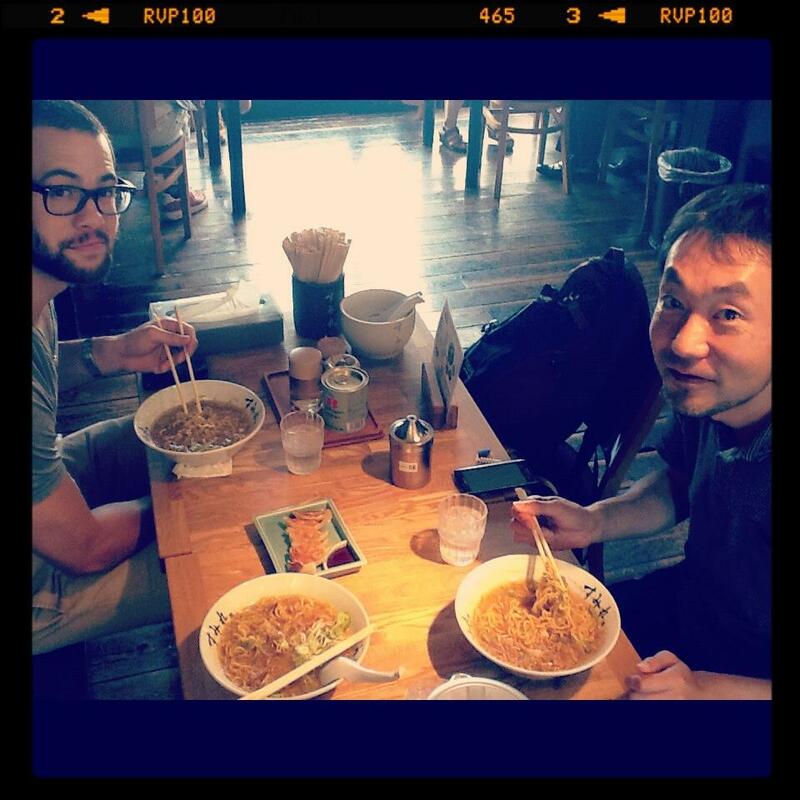 Ramen + Gospel: Chris Juday (left) and I enjoyed some delicious ramen at the famous Sumire ramen shop with one of his English students (pictured). He shared about his job and when he asked me about mine I seized the opportunity…I whipped out my iPad and shared the gospel using C2C slides. Pray for fruit! 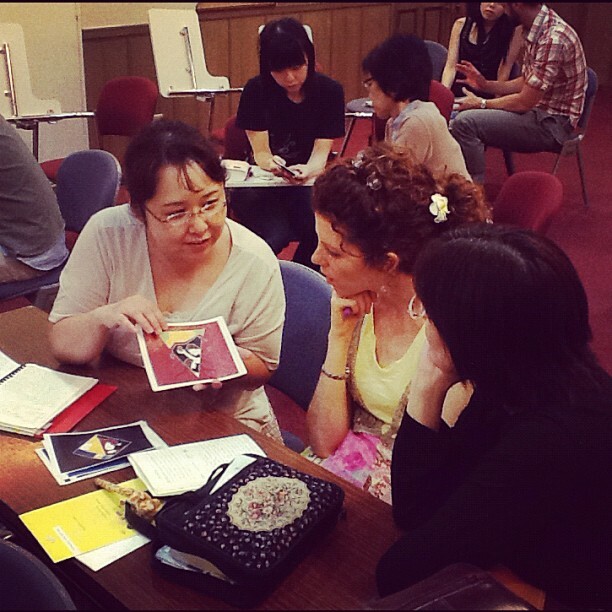 Troy attended a weekly “Let’s Talk English” hosted by the city of Sapporo. 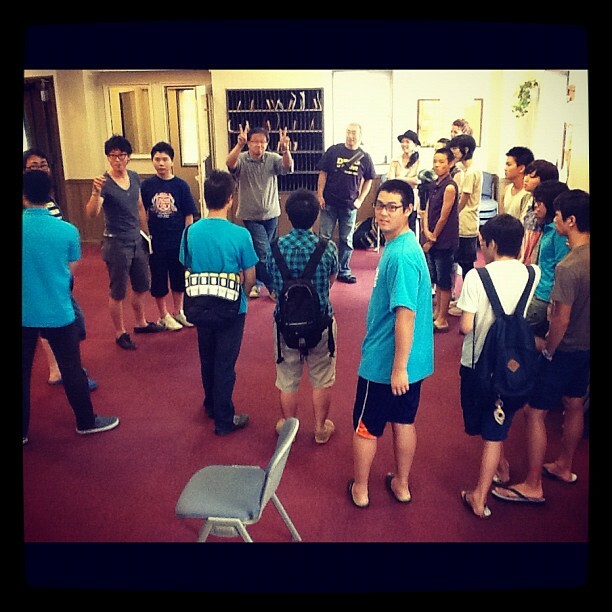 It is a chance to meet English speakers and invite them to PRIME. 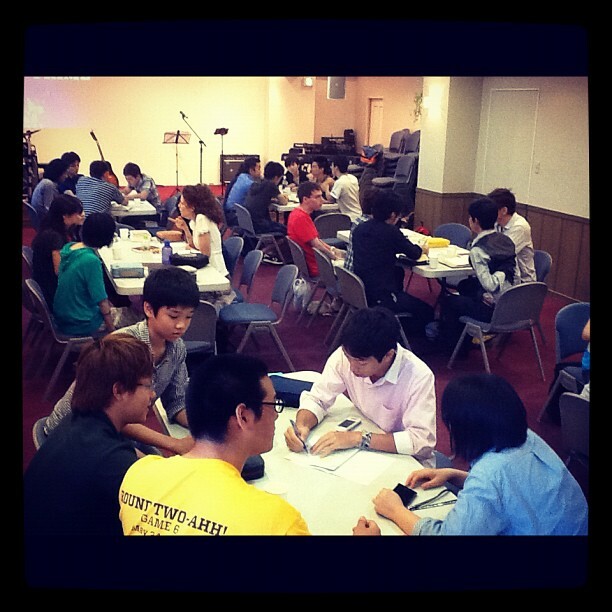 Shindoh san (white shirt) has come to PRIME and studied the BIble with us for a few weeks. Troy was able to clearly share the gospel a number of times. Please pray for fruit! PRIME is our weekly English Bible study which serves to evangelize non-believers and disciple believers. 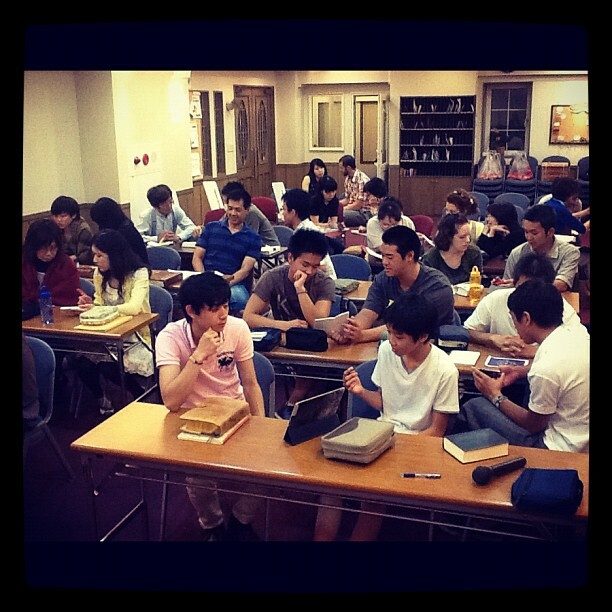 Here many are gathered to study using T4T 3/3s format. Pray for fruit! 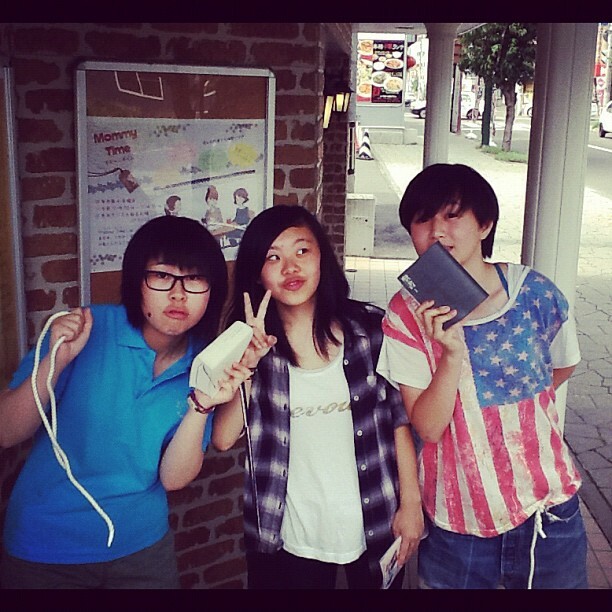 L to R: Mako, Noa & Elisa get ready to go share the gospel in downtown Sapporo. Special Visitor: Manabu Takahashi, our dear friend & former English student from Indianapolis (1998-2003) came to visit us from Tokyo. He is college basketball player who loves to travel. We were so encouraged by our time with him. His parents & older sister (Megumi) came to visit us in Sapporo the following weekend. His other sister, Ayumi, works at the Tokyo airport so we get to see her every time we fly through. We are on top of Mt Moiwa overlooking Sapporo in this photo. Rachel has a multi-faceted ministry here in Japan. One of them is teaching/speaking. Here she is getting ready to speak to a group of young mothers at the monthly “Mommy Time” outreach event. She spoke on how to love your children (of which she is well qualified to speak). 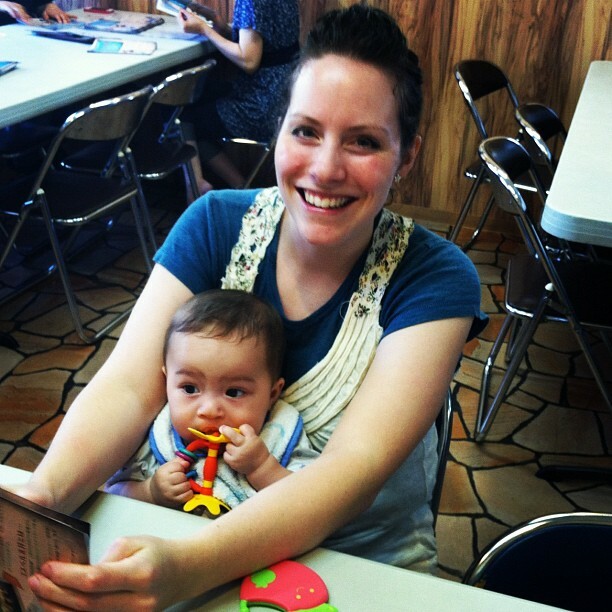 God has used Mommy Time to bring a number of women into discovery Bible studies. Pray for fruit! 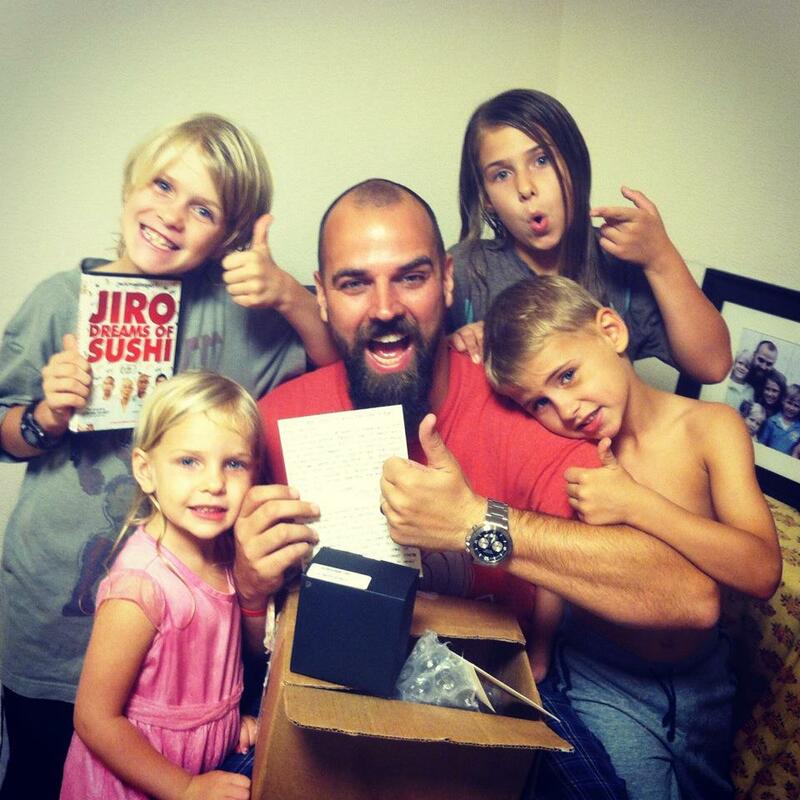 Castleview Care Package: Pastor Eric Bancroft send us this care package that included a commemorative gift watch from Castleview Baptist Church. It was a HUGE encouragement to us and was fun for the kids to open. We are thankful for God’s global church! 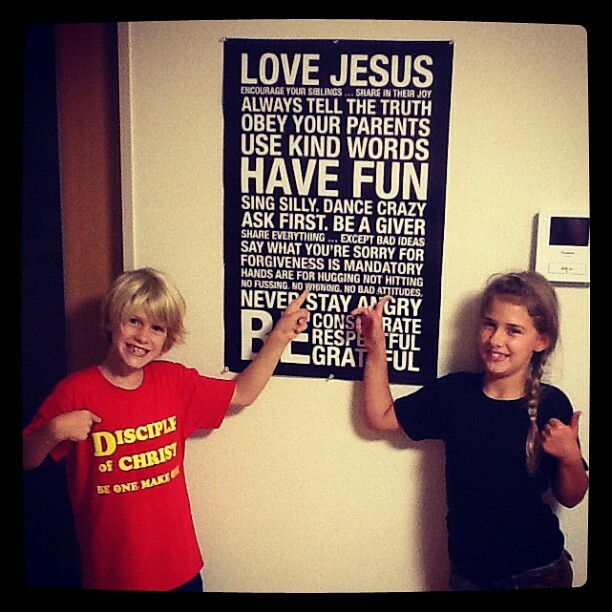 Mayah & Malachi displaying Rachel’s favorite poster. 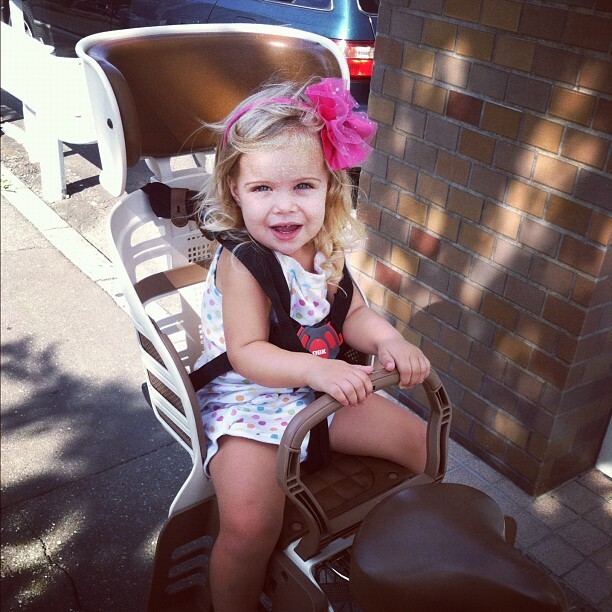 Lucy loves rolling on the back of Rachel’s bicycle. Its her “minivan” in Japan. We drive to Iwamizawa city every month for preaching, disciple-making training and fellowship with Pastor Nakajima and Vine Church Iwamizawa. It is a monthly highlight for our family. Enjoying some “Western” fellowship over dinner with the Nakajima family including pastor’s parents. Disciple-making training in Iwamizawa. 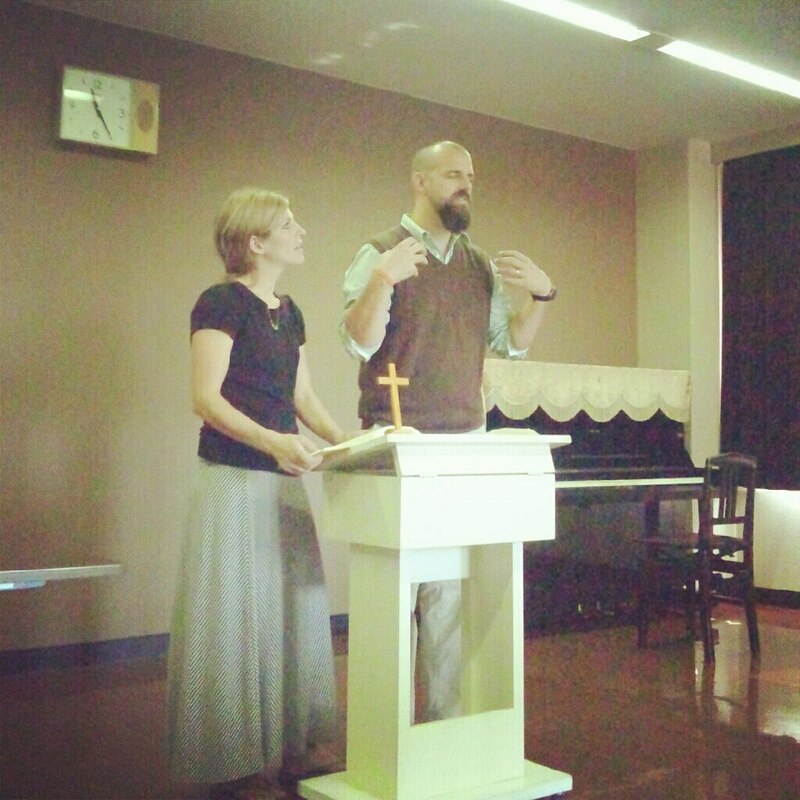 They have the conviction to make disciplers and have vision to reach the 80,000 in their city. Pray for fruit! 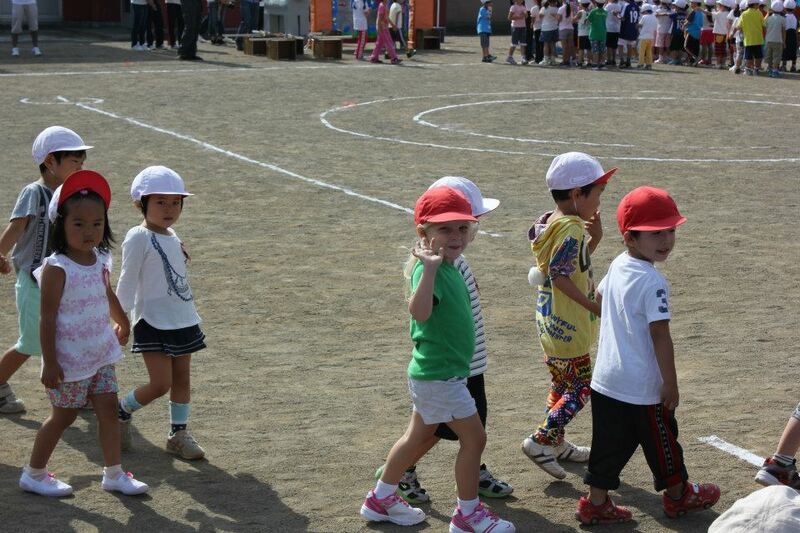 Undokai (“Sports Day”): Tessa waves during the opening ceremony. She is on the red team. 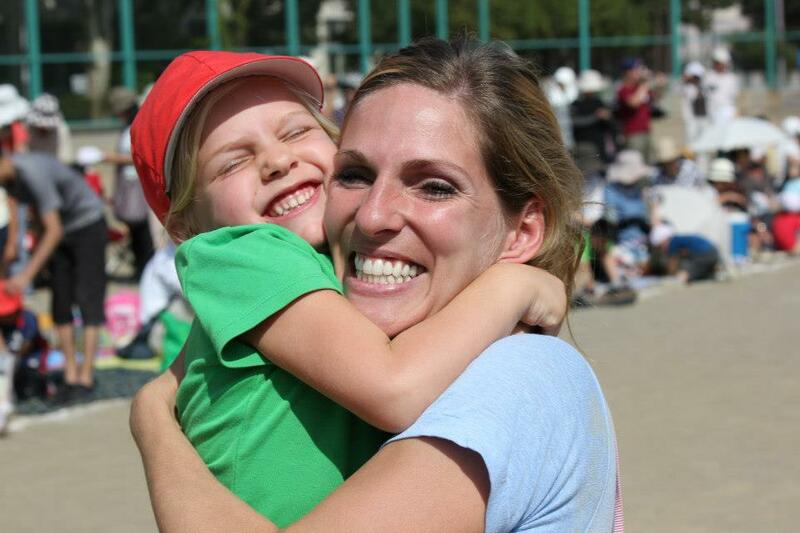 Undokai: Tessa receives a congratulatory hug from Rachel after finishing her events at the Kindergarten Undokai (“sports day”). Even the grandparents get into the competition at undokai! Undokai: Isaiah hanging with friends on the red team. 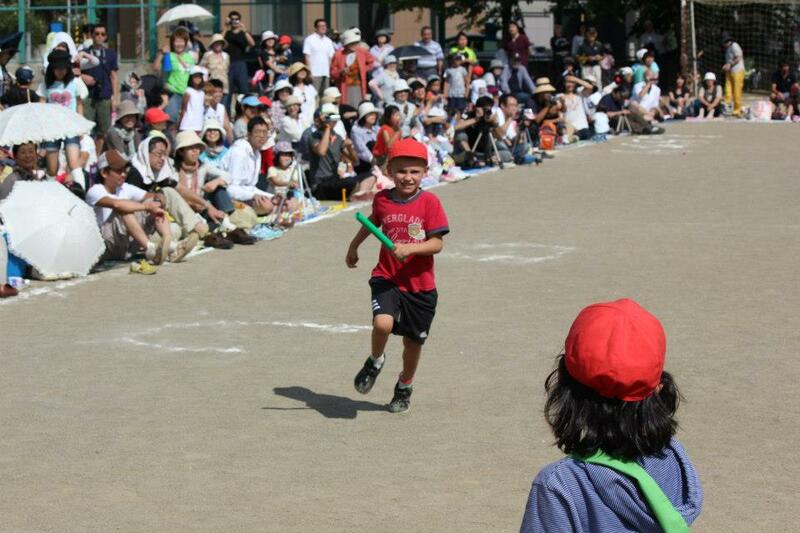 Undokai: Isaiah running the relay race at Undokai! Thank you for your continued love, encouragement, prayers and support! We are loving life and ministry here in Sapporo, Japan!! Care Package! : It means so much to us when we hear from people. So you can imagine how special it was when the kids opened up this box of gifts from aunt Amy Long. Mary Lou Cooper, Karen Long & Beth Timberlake also contributed to this cube of joy.